Hear the name, Bentley, and it likely calls to mind a luxurious, if lumbering beast, perhaps a uniformed chauffeur sitting up front, its passengers sipping Champagne in the spacious back seat. 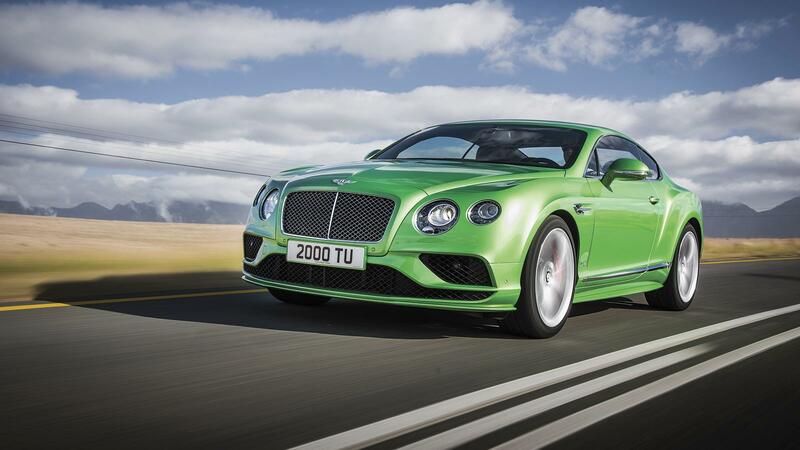 Well, a quick glimpse of the new Bentley Continental GT Speed is certain to change that impression—all the more so if you have a chance to take one for a ride. While the British marque today produces some of the world's most high-toned automobiles, its roots trace to the track. The legendary "Bentley Boys," a group of racers assembled by company founder W.O. Bentley, dominated the grueling 24 Hours of Le Mans in the era after World War I. The maker has been showing that same stuff once again in recent years, including a 2003 Le Mans win with the EXP Speed 8. While the GT Speed offers all the luxury features you'd expect of a modern Bentley—including the matched leather hides and meticulously hand-finished woods, it's a genetic heir to those track cars, something it proved in May by setting a new British land speed record for the flying mile. With actor Idris Elba behind the wheel, it clocked an average 180.361 mph on the beach of Pendine Sands, in Wales. Other than changing tire pressure, the coupe he drove was a stock GT, powered by Bentley's massive 6.0-liter turbo W-12 making 626 horsepower and 605 pound-feet of torque. Incidentally, that was actually well short of the Continental GT Speed's official top speed of 206 mph, a number you'd likely need a paved track—or a lengthy stretch of Autobahn—to prove out. But it's up to you to decide whether the GT behaves like a lion or a pussycat. While you might be tempted to keep your foot to the floor, the seductive coupe is a joy to drive even in traffic, with its studio-quality Naim audio system providing the soundtrack. Its well-damped air suspension readily swallows up even the roughest bumps and potholes. But switch to Sport Mode and you'll fly around corners pulling the sort of g-forces you'd expect from a sports car weighing half the Bentley's hefty 5,115 pounds. Visually, the GT Speed is distinguished from other Continental models by a front splitter, side sills and a rear diffuser—all meant to enhance aerodynamics—along with distinctive 21-inch alloy wheels, bright red brake calipers and Speed badges that declare your status to mere mortals. If you'd prefer to drive al fresco, you also can order a convertible version, though you'll sacrifice a little at the upper end, the rated top speed slipping to just 203 mph. The fastest and most powerful model the marque has ever offered for street use, the Bentley Continental GT Speed starts at $237,125. As with all of the British maker's products, you'll have endless options to customize your cruiser—and to drive up the price tag.